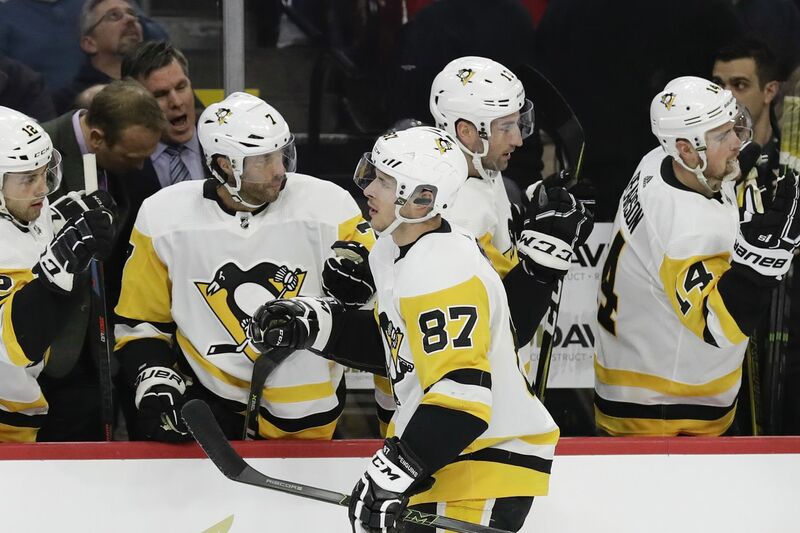 Pittsburgh Penguins center Sidney Crosby celebrates his first-period goal with his teammates on the bench against the Flyers on Monday, February 11, 2019 in Philadelphia. It’s not often you watch playoff hockey before Valentine’s Day. That’s what this felt like, before and after. It stung a bit that Flyers’ 10-game point streak, with nine wins, ended, period. The run salvaged a lost season that cost a coach and a general manager their jobs, but now a playoff berth was within reach; more so if the Flyers could beat the Penguins. It stung a bit more because the current run of success was fueled by the precocious play of rookie goaltender Carter Hart. No town loves its next goalie messiah more fervently than Philadelphia, which sees few enough of them. The loss ended Hart’s quest to become the first goalie in NHL history to win nine games in a row before the age of 21. But the 4-1 loss stung most, and deepest, because was delivered by the Pittsburgh Penguins, and Evgeni Malkin, and, of course, Sidney Bleeping Crosby. And won by the Flyers’ rivals, whose best players are their nemeses. Crosby scored the first goal. Malkin assisted on the second. Crosby assisted on the third and fourth. Not this day. In the biggest game of the season, the Penguins were, simply, better. Maddeningly, because it’s the same Pens who have won their five Stanley Cups since 1990 while the Flyers watched on the other end of the Pennsylvania Turnpike, their two straight Cup wins faint memories of the Watergate era. The same Pens who dominated the Flyers in their six-game, first-round playoff series win last spring. The same Pens whose smirking leader’s face iced the urinal cakes at the Wells Fargo Center in the playoffs last year. A photo of Pittsburgh Penguins center Sidney Crosby sits in a urinal at the Wells Fargo Center during game three of the Eastern Conference quarterfinal playoffs last April. Monday night, he played like he was ... ticked. The Penguins had lost four in a row and were clinging to the final playoff spot in the Eastern Conference as they visited the Flyers for the first time this season. The teams had three games remaining. The Flyers were within six points of the Pens, whose once-fearsome power play was 1-for-19 over the last eight games. That’s a six-point swing if the Flyers had swept the three games in regulation. Now, their path must be different; and, most likely, more difficult. It seems like an opportunity lost. Not wasted -- the Flyers played well -- but lost. How big was the game? So big that Voracek was espousing defensive responsibilities at the morning skate. How big? Malkin had missed the previous five games. He was expected to miss another Monday night, but desperation (the four losses) and history sped his return. Malkin had compiled 68 points in 54 games against the Flyers, his second-highest total against any team. He’s almost as prolific as Crosby. Sid the Kid had a point in the previous five games against the Flyers, 10 in all -- three goals, seven assists. And he thrives on antipathy. By far the most hated of any opposition player, Crosby had 16 goals and 27 assists in 30 games at the Wells Fargo Center. He destroys the Flyers, who are paving his way to the Hall of Fame. He had 39 career goals against them, his most against any opponent, in 64 games. Make that 40 in 65. Crosby scored just over 8 minutes into the game. It was the easiest goal of the 40. Ivan Provorov sent the play to the northeast corner, away from Crosby ... and followed it. Crosby lingered by the southeast post ... as Sean Couturier cheated up ice. The puck bounced back to Crosby. Somehow, the Flyers lost Crosby. Somehow, the Flyers lost the puck. He found it, and potted it. Both Provorov and Couturier blamed the quirky bounce. Neither explained how Crosby found himself alone. It was a rare moment of sloppiness, especially with Couturier on the ice. His line hadn’t been scored upon in the Flyers’ current five-game homestand. Malkin struck, subtly, just over seven minutes into the second period. He charged down the left side, drew a defender then left it softly for Nick Bjugstad, who was alone. Bjugstad snapped it briskly under Hart’s left pad. Crosby started the play that ended with Jake Guentzel’s team-high 27th goal, a wraparound stuffed between Hart’s legs. He found Kris Letang for an empty-net goal with 13 seconds left. The Flyers hardly could have done more. They had a power-play goal nullified by an errant whistle, which would have cut it to 2-1. Nolan Patrick poked in Travis Konecny’s rebound with 7:07 left in the second period, but the official, assuming Murray had gloved the puck, erroneously blew the play dead. They outshot the visitors, 51-27, their highest shot total of the season. They fired a team-record 28 shots in the second period, three more than the previous best, done twice. They top-loaded lines, occasionally mixing Claude Giroux with Voracek. “In the standings, this hurts, yes,” Couturier admitted. They out-hit (29-23) and they out-hustled and they frustrated the Penguins. Malkin took a match penalty when he chopped down Michael Raffl (after Raffl punched him in the back of the head). That gave the Flyers a power play for the rest of the evening, and Voracek scored once. Hart was fine. He deftly turned aside the first two shots of the game, and he brilliantly stoned Bjugstad 6 minutes into the third, and he finished with 24 saves. He also finished with his first "L" since Jan. 12. It’s easy to figure which one hurt most. It was his first game against the team Philadelphia likes least, but certainly not his last.